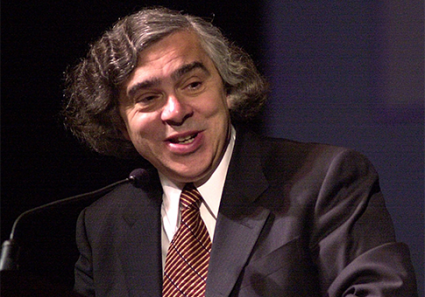 Cosmetic professionals are divided on the haircut of energy secretary nominee Ernest Moniz, voicing reactions that range from comparisons to Donald Trump to applause for Moniz's self-confidence. If confirmed, the Massachusetts Institute of Technology (MIT) physicist is expected to move to fashion hotspot Washington, D.C.. But the city’s top hair stylists disagree on whether he’s due for a trim. The cut is fine "for a professor at MIT. He looks like a scientist," said Paul Ramadan, the owner of Nantucket Hair Salon in downtown Washington. "But for Washington, I’m sure he’s going to get [reactions], like, ‘Oh, wow,’" Ramadan said, feigning a look of surprise. "He’s obviously not a typical Washingtonian walking around." Rather than change his hair style, however, Ramadan suggested Moniz embrace it. "Sometimes when you are in the spotlight, the haircut becomes the person himself," he said. His final judgment was praise. "I really feel like he’s comfortable with himself and confident," Ramadan said. Other stylists were not so generous, however. Moniz looks like he is "in a Donald Trump competition," said Dennis Roche, owner of Roche Salon, also in downtown Washington. "If you’re going to sport long hair, you have to have a good haircut that supports long hair," he said. "I don’t think his haircut necessarily works for him." Roche said the width of Moniz’s cut tends to broaden his facial features. "When it’s broad like this, it makes you look heavier across the face," he said. Roche suggested "a more layered haircut." As is, he said, the cut does not fit the D.C. look. "If he was at the Renaissance Fair, it probably would work," Roche quipped. Other critiques were even harsher. "Oh my God, it looks terrible," said David Cassis of the Patrick Segui Hair Salon. "He’s not going for anything. His face, his hair, nothing has to do with anything." Cassis didn’t mince words. "He looks ugly," he told the Washington Free Beacon.